Born in Paris in 1895, Jean- Michel Frank was exposed to the horrors of the First World War when still a child. Disposing of a considerable fortune, he was drawn to the high intellectual circles to be found in Paris when the war ended, meeting some of the most famous people of the time, many of whom became faithful clients. Having studied law in order to enter the world of finance, he decided this course was not for him, and in 1921 began his career as an interior designer. His first projects were for his friends Pierre Drieu la Rochelle and Charles Peignot. From the outset, the formal simplicity of his style and his use of original materials set him apart from his contemporaries. Frank banished objects from his interiors, which he furnished using only the purest, almost monastic, pieces of furniture. His work came to the attention of Charles and Marie-Laure de Noailles, whose architect advised them to involve him in the decoration of their town house in Paris in 1925. Completed in 1926, this project figured in an edition of Art et Industrie the following year. From this point on, Jean-Michel Frank was acknowledged as one of the great Parisian interior designers. Commissions flew in, issued by celebrities such as the designer Elsa Schiaparelli, the industrialist Robert Chevalier, the composer Cole Porter, and Nelson Rockefeller in New York. Working with the company Chanaux to create his furniture, Jean-Michel Frank also engaged artists to design exceptional pieces for his interiors. The first artist to work with him was the sculptor Henri Laurens, who mainly created pieces in metal. Alberto Giacometti, who he met in 1928, chiefly made bronze lights and plaster vases with a white or black glaze, and the painter Christian Bérard designed motifs that were transposed onto carpets or hangings. The architects Emilio Terry and Paul Rodocanachi were also involved. Jean-Michel Frank drew from their multiple talents, selecting and commissioning the most modern pieces to furnish his pure, uncluttered settings. In his interiors, walls were lined with parchment, leather, or simply whitewashed; seats were strict, with a neoclassical feel; his U-shaped tables were inlaid with ivory or mica; straw marquetry screens united the whole. Frank probably discovered the surrealist painter Salvador Dali in 1930 at a dinner party at the Noailles’. Their collaboration notably resulted in screens decorated by the painter, which were presented in Frank’s boutique when it opened in 1935, rue du Faubourg-Saint- Honoré. 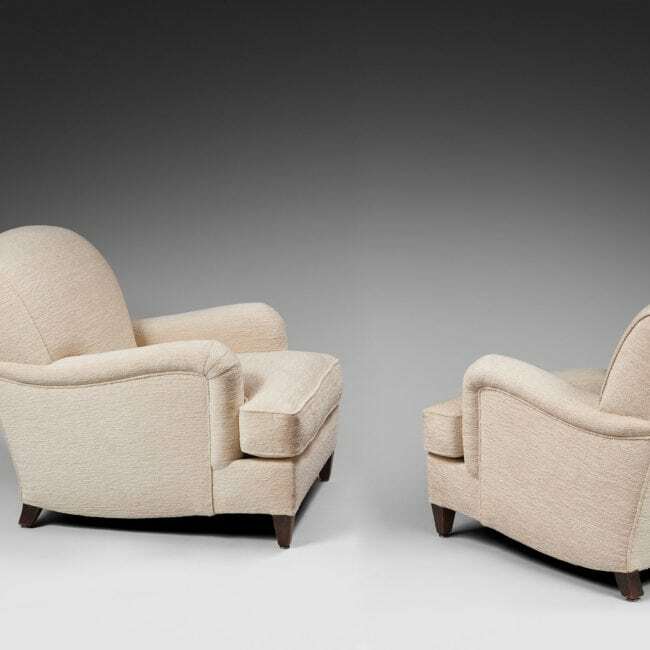 The famous mouth-shaped ‘Mae West’ sofa also resulted from their collaboration, as did the striking wooden standing lamp decorated with gold leaf. 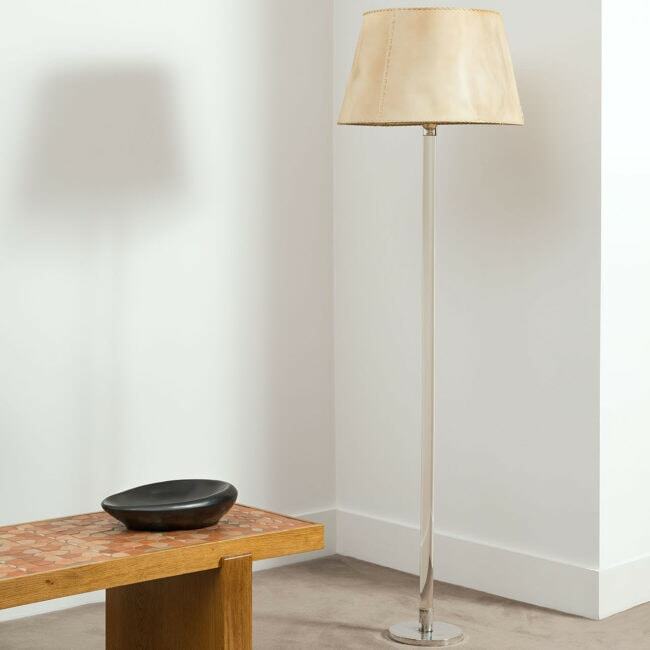 This lamp even figured in Jorge Born’s house in Buenos Aires, one of the last and best-known projects Jean-Michel Frank accomplished. This interior is considered one of the most perfect actualisations of the designer’s aesthetic. Here, he united pieces by his many collaborators: a large drawing room, lined with parchment, contains lights and vases by Giacometti, a few chairs by Rodocanachi and carpets designed by Bérard. The smoking room draws together pieces by Terry and Giacometti, and a screen decorated by Salvador Dali. The leather-panelled library is punctuated by a number of lamps, including the wooden standing lamp designed by Salvador Dali. When Frank returned to France, war had been declared against Germany and Chanaux & Co. had to close. In 1940, he left France for Buenos Aires, where he became artistic director of the company Comté. In 1941, he went to New York, most probably for professional reasons. Deeply troubled by news of the war that had broken out, he killed himself by throwing himself from a building.